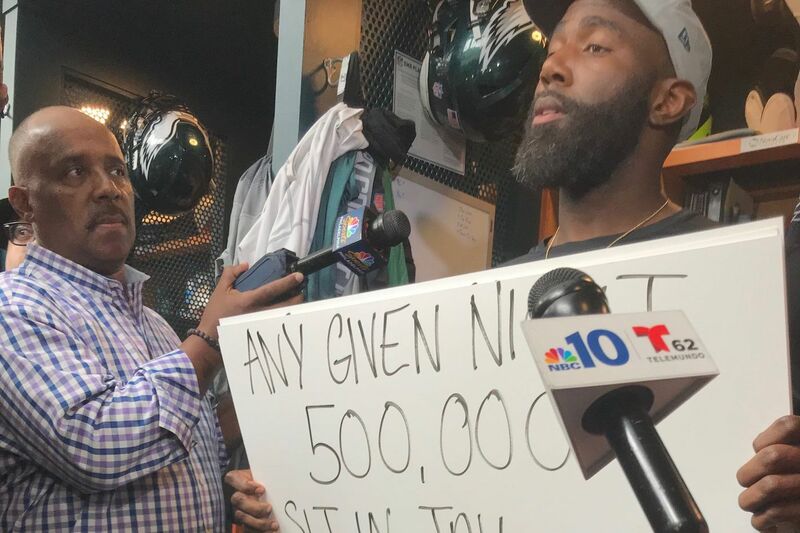 The Eagles' Malcolm Jenkins chose to speak to the media by holding up signs the day after the team was supposed to visit the White House. It was the Eagles' turn to respond to President Trump on Wednesday, although the team was uninterested in engaging in a war of words with the White House. In fact, safety Malcolm Jenkins chose not to speak any words at all. Jenkins, the Eagles' most outspoken player, stood in front of his locker with 10 handwritten signs. While cameras focused on him, and reporters peppered him with questions about the White House rescinding the Eagles' invitation, the safety remained stoic. He held up a sign for a few seconds, dropped it to the ground, and showed the next sign. When he was finished showing the signs, he left. There was no question-and-answer session. "More than 60 percent of people in prison are people of color"
"Nearly 200,000 juveniles enter the adult criminal system each year, most for non-violent crimes #stopschoolpipelinetoprison"
"In 2018, 439 people shot and killed by police (thus far); In U.S. Pop. – 8 percent African-American males; Shot by police – 25 percent African-American males"
"Any given night, 500,000 sit in jail; Convicted? No; Too poor? Yes"
"True Patriots: Anquan Boldin, Doug Baldwin, Richard Sherman, Devin McCourty, Josh Norman, Chris Long, Torrey Smith, Rodney McLeod. Michael Bennett, Ben Watson, Demario Davis, Carl Davis, Kelvin Beachum, Matt Slater, Josh McCown, Duron Harmon, Johnson Bademosi"
"Ben Watson and Demario Davis helped push through La. House Bill 265 Restoring voting rights for returning citizens"
"Devin McCourty, Duron Harmon, Matt Slater and Johnson Bademosi lobbied to raise the age from 7 to 12 entering the criminal justice system"
"Colin Kaepernick donated $1 million to charity"
It was Jenkins' way of steering the conversation to substantive issues and not the he-said, she-said of the disinvitation. Jenkins' words, albeit on poster board, went beyond the surface more than coach Doug Pederson's comments. Pederson said he had looked forward to going to Washington and being recognized by the President, but he would not discuss the number of members of the organization who were going to join him or the timeline that led to the cancellation. He didn't care that it was a national story. He cared about his afternoon practice. "I'm not discussing; it's over," Pederson said. "What you've seen and what you've heard is enough. I'm not going to sit here and discuss it. We have two OTA practices and a mandatory camp next week." Pederson did not mind wearing the shield for the organization instead of owner Jeffrey Lurie, saying the Eagles had a united front. He acknowledged that the Eagles could have proceeded with their other events scheduled in Washington, but once the White House disinvited them, they decided to stay in Philadelphia and practice. "It's over. It's behind us. We're moving on," Pederson said. In the locker room, players did not want to reveal whether they had planned to attend the White House. But they insisted that it was not a divisive issue. That was a major message on Wednesday. "I think we're, like, 100 percent unified going into this week, so it's mathematically impossible to be any more unified," Long said. Center Jason Kelce noted that an NFL locker room is a true melting pot. There are players of different races, backgrounds, and beliefs, allowing them to understand and embrace differences. "I think everyone in this locker room understands that everyone's heart is in the right place," tight end Zach Ertz said. "We weren't going to let someone try and formulate an agenda. … I think that's what's unique about this locker room. Everyone's treated with respect. Everyone truly cares about one another. People respect other peoples' opinions. It's not my job to try to change Malcolm's. It's not my job to change Malcolm's or anyone else." They also were not provoked by the White House's rhetoric about the team, specifically that they had abandoned their fans. The players and Pederson lauded the Eagles fans. Their parade up Broad Street offered the evidence they needed about their relationship with the fans. Ertz even took the high road when asked about Fox News using an image of him kneeling in prayer when the host discussed the national anthem controversy and the canceled White House visit. He said he had neither demanded nor needed an apology; he just wanted the record set straight. Fox News issued an apology. It was an atypical June day at the NovaCare Complex, with national media outnumbering the players in the locker room after practice. This is a time of year when attention is usually devoted to the rehab of injured players or a position competition that appeals to the most devoted fans. Players are not accustomed to fielding questions about the President or having their commitment to their fans or country questioned. It's a small price to pay for winning the Super Bowl. One of the championship customs is typically meeting the President. But on Wednesday, they did not raise gloves against the White House. Ertz spoke for more than 10 minutes wearing a Team USA soccer jersey, and he admitted his attire for the cameras was not just to support his wife's profession. "I'm also a proud American," Ertz said, "and I'm proud of this locker room, as well."